Just to say we all had a great time on Saturday with our 2 teams in Essex, everyone really enjoyed it, however I have done it before at kempton racecourse with your company & you had a couple more activities which did make it a little bit more fun. We would like to book again for next year if you are doing Essex but would like to know the other activities ie washing machine & penguin would be included. Our time at Mayhem paint-balling was great. The girls had a great day and experience. Many of them had never done this activity before and it exceeded their expectations as well as challenged some. The day is well organised with the games. The instructors are very knowledgeable and were always on hand to help. This is a great team building activity for all ages and allows pupils to take on board leadership skills, in how they attack their opponents. Overall we had a fun filled and very enjoyable day. Just wanted to drop you an email to say a big thank you for all of your help yesterday to you and all the guys who were there. It was a brilliant day out that was enjoyed by everyone, which wouldn’t have been able to happen without you and your team. The weekend was good thanks, all the students were raving about it and we'll be back again in Spring. The receipt you emailed me was fine so I don't need the other one anymore. Ross White University of East London - Mayhem is the best Paintball site i have ever been to we will definitely be back next year. 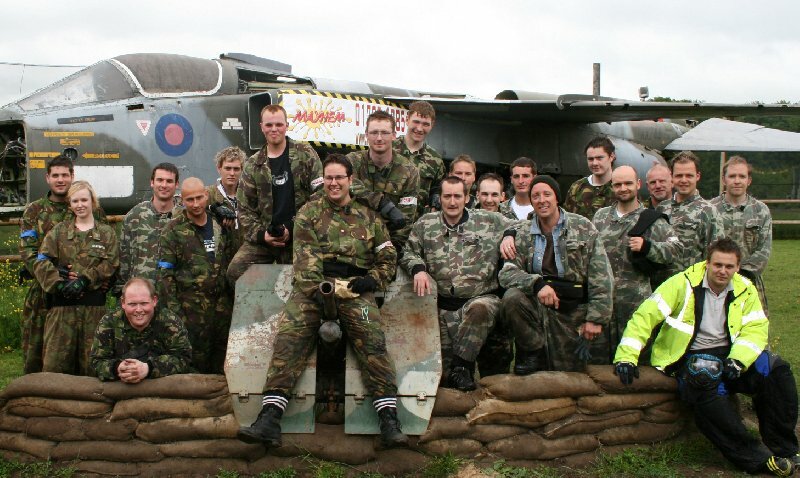 Amy Snell Barclays bank - My team just wanted to say a big thanks for the paintball day last Thursday. Everyone had a really great time and thoroughly enjoyed themselves. A few of them have recommended your site to their friends already. Mayhem in Abridge for our tournament, the staff were professional and ran the event without a hitch. They were very accommodating to all of our requests and were very flexible with how the event operated. We were also impressed with the standard of the lasertag equipment, it was obvious the site staff took pride in their guns and maintained them to a high standard. This is a site we will definitely be using again. Ashley Flexen - Mayhem is the best! we have been else where but never again see you again soon. Robin Hirst Rodding valley school - I've been to Mayhem paintball 16 times and every time its got better. There is always something new to experience from levels to equipment and i enjoy each time better than the last. me and my friends have been to many other paintball sites and ever since coming to Mayhem we haven't gone back to them.if i was to recommend any paintball center it would be this one. Gavin Hickey Teacher at Barking college - We had a fantastic day at Mayhem Paintballing. Joe and Dean our Marshalls were fantastic, running the games everything was extremely well organised and we were very well looked after. Dmytro Loginov - We would like to thank all the Mayhem staff for a great day. We all had a really great time and will be back. It was a very well organised day, and all the staff were very helpful. Especially our Marshall with the beard who was very professional and entertaining, whilst maintaining a serious emphasis on safety. The venue was excellent with a wide range of game zones. we were also very impressed with the quality of the equipment you issued us with. i don't Think anyone in the group ran out of gas or had a gun jam throughout the entire day! overall we would rate Mayhem Abridge a 10 out of 10.